The recent increase in the rate of the Greenland ice sheet melting has raised with urgency the question of the impact of such a melting on the climate. As former model projections, based on a coarse representation of the melting, show very different sensitivity to this melting, it seems necessary to consider a multi-model ensemble to tackle this question. Here we use five coupled climate models and one ocean-only model to evaluate the impact of 0.1 Sv (1 Sv = 106 m3/s) of freshwater equally distributed around the coast of Greenland during the historical era 1965–2004. The ocean-only model helps to discriminate between oceanic and coupled responses. In this idealized framework, we find similar fingerprints in the fourth decade of hosing among the models, with a general weakening of the Atlantic Meridional Overturning Circulation (AMOC). Initially, the additional freshwater spreads along the main currents of the subpolar gyre. Part of the anomaly crosses the Atlantic eastward and enters into the Canary Current constituting a freshwater leakage tapping the subpolar gyre system. As a consequence, we show that the AMOC weakening is smaller if the leakage is larger. 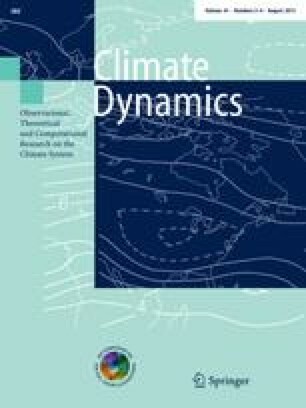 We argue that the magnitude of the freshwater leakage is related to the asymmetry between the subpolar-subtropical gyres in the control simulations, which may ultimately be a primary cause for the diversity of AMOC responses to the hosing in the multi-model ensemble. Another important fingerprint concerns a warming in the Nordic Seas in response to the re-emergence of Atlantic subsurface waters capped by the freshwater in the subpolar gyre. This subsurface heat anomaly reaches the Arctic where it emerges and induces a positive upper ocean salinity anomaly by introducing more Atlantic waters. We found similar climatic impacts in all the coupled ocean–atmosphere models with an atmospheric cooling of the North Atlantic except in the region around the Nordic Seas and a slight warming south of the equator in the Atlantic. This meridional gradient of temperature is associated with a southward shift of the tropical rains. The free surface models also show similar sea-level fingerprints notably with a comma-shape of high sea-level rise following the Canary Current. The research leading to these results has received funding from the European Union’s Seventh Framework Programme (FP7/2007-2013) under grant agreement no 212643 (THOR). DS and JM also acknowledge financial support from the CNRS/INSU/LEFE/EVE French program through the Ti Ammo project. CR performed these simulations at the German Climate Computing Centre (DKRZ), Hamburg. DS and JM benefited of the HPC resources of CCRT and IDRIS made available by GENCI (Grand Equipement National de Calcul Intensif).